Oregon Baseball World Series Bound? 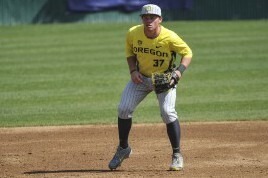 The Oregon baseball team has come a long way since the reinstatement of the program in 2009. That year, the Ducks finished dead last in the Pac-10 with a record of 14-42. Since then, the Ducks have improved drastically, earning a trip to the NCAA Regionals four out of the last five years and hosting the event in 2012 and 2013. But even with the program’s successes, the Ducks haven’t won the Pac-12 or made it to the College World Series. Coach Horton will try to take the Ducks to the College World Series for the first time since 1954. Last year, the Ducks lost in the Regional round to the eventual World Series champion Vanderbilt. As nice as that is, that was last year and it’s time to move on to 2015. Coach George Horton built a powerhouse team and led Cal State Fullerton to the College World Series in six out of the 10 years he coached there. 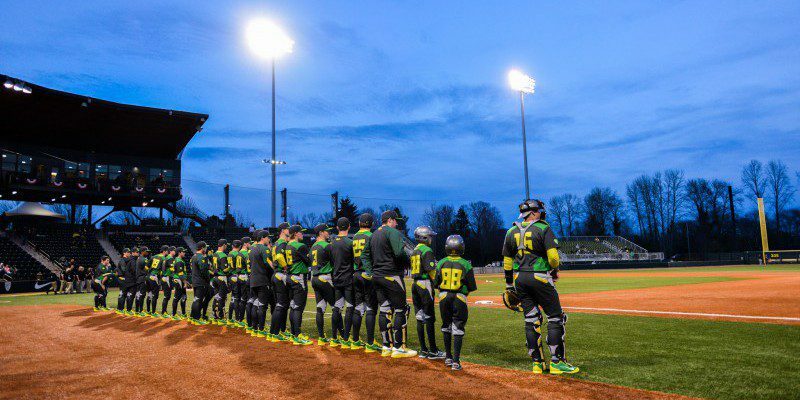 After building the Oregon program from the ground up, could this be the year the Ducks make the trip to Omaha? In the preseason, Oregon was picked to finish second in the Pac-12, behind UCLA — who won the World Series in 2013. Also, the Ducks are ranked in all six preseason polls, coming in as high as No. 14 and as low as No. 22. An interesting stat to consider is that Oregon is one of only eight teams to win at least 40 games in each of the last three years. If the Ducks are to get back to the postseason, 40 wins is most likely their magic number. Tolman (37) is a third-team All American and the Ducks team leader. 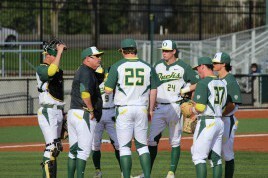 Oregon opened the 2015 baseball season last week against Hawaii, winning the series 3-1. In that series, the Ducks had two comeback wins, transfer third baseman Matt Eureste hit a home run in his first ever UO at bat, and junior infielder and team leader Mitchell Tolman has a four-game hit streak to start the season. Offense hasn’t been a problem for the Ducks since Horton took over the program; in fact, senior catcher Shaun Chase led the Pac-12 in home runs last season as a junior. The main problem for the Ducks has been consistent pitching early in their games. In the only loss against Hawaii, the Ducks’ starting pitcher, Trent Paddon, allowed seven runs in the first two innings. However, a positive force and name to remember is freshman left-handed pitcher David Peterson, who racked up eight strikeouts in only six innings, allowing only one earned run in the Ducks’ 3-2 win in Game 2. Oregon baseball is back in Eugene tonight as the Ducks host New Mexico State in the home opener at PK Park; first pitch is scheduled for 6:03 p.m. The Ducks have the talent and the coaching experience to make it to Omaha this year. I won’t say it’s going to happen, but I think the time is right. Go Ducks!